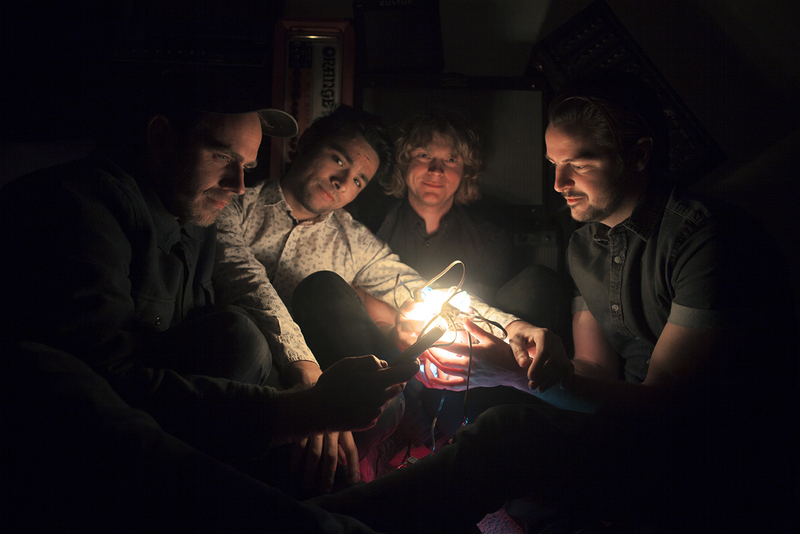 Sanderlings' Woody Chats About Music and So Much More! DIY musician Woody Locke is the brainchild behind this pop punk/garage rock/pop act called Sanderlings. Whose most recent working's is their latest single made video release called "Stories" off their upcoming "Self-Titled" album out this summer! Woody himself goes into chatter, about why this band came to be, their recent single, accompanying album, and the future straight ahead. Woody: Oh boy, well recently I’ve really liked the term beach goth but we really aren’t that at all. I used to say we were surf-rock but I don’t think that really fits us either so now I just tell people we’re ocean-themed rock, which sounds cory because it is. Woody: Well in 2016 I had this idea that I was going to write and record an EP by myself without telling anyone so for about 2 weeks I holed up in my studio and wrote/recorded 4 songs. When I put them out people seemed to like them so I decided to put a band together to play the songs live and have a release show for the EP. Now we are a 4 piece band with a record coming out! How does this even happen? 3. How did you come up with the band's name Sanderlings, does the name have a meaning to it? Woody: Musical influences are Jawbreaker, The Replacements, Pansy Devision, Japandroids… Everything on Polyvinyl really, they don’t know it yet but they’re going to put out one of our records some day. Non musical influences are definitely my dog, Bandit, who is a maniac and never stops running, this little patch of wild land that I take him to a lot we we sorta just roam about. I like that place. I like donuts they’re pretty inspiring. Juggalos inspire me, they get so much ridicule just for liking one band. People are so judgy. 5. What are your dreams and goals? Woody: Hi, hello. My name is Woody and I write the bulk of things, at least on this record. Our lineup has been more solid as of late and we started arranging our music in a more collaborative sense but lyrics and most song structure is still me. Uuuh a lot of the songs are about Juggalos and like how dope the tides are, DID YOU KNOW THAT ITS CONTROLLED BY THE MOON?? 7. Speaking of which, tell me about the single made video for "Stories"? Woody: The story of the video shoot is pretty funny but I can’t tell it because it’s a national security risk. So all I’ll tell you is that there was no collusion. None. AT. ALL. The story of the video itself is a metaphor for boy who is bored with his role in life and feels trapped by his friends who want him to play the same role over and over. In the end they all party in animal costumes. Have you ever watched Groundhog Day? Watch that instead, it’s longer and the acting is top notch. 8. That track comes off your upcoming "Self-Titled" album, why go with naming it after yourselves? Woody: Well! We kept kicking the can down the road on what to name it, WE LEGITIMATELY COULD NOT AGREE. Then we ran out of time because we were slackers and procrastinated. Moral of the story: set deadlines, keep them. Adam had a good point in that it’s easy for people to remember, so we got that going for us! 9. What would be the best way at describing this album as a whole? Woody: A SONIC JOURNEY THOUGH LOVE AND ALTERED STATES OF MIND. But really, I think it’s a good indie-rock album all the way through full of catchy short songs and fun hooks. 10. How do you promote your band and shows? Woody: Have you ever seen those people who sit there and hand out flyers to strangers?? Yeah we don’t do that. I guess it would probably help us if we did. 11. Do you have any plans for shows or tours coming up? Woody: We have a handful of shows in the Southern Cali area in the next 2 months and I’m doing a one month solo tour to promote the songs. Anyone wanna be my road dog? 12. What else would you like to add or say? Woody: I saw in the news that they just discovered a preserved dinosaur tail IN AMBER. Someone tell Jeff Goldblum quick!